Assistant Minister of Coastal Road and Sebuyau State Assemblyman, Datuk Julaihi Narawi (third left) officiating the UiTM EduTourism programme at Dewan Pembangunan Sebuyau. Also present is Rector of UiTM Sarawak, Professor Dato Dr Jamil Hamali (third right). SEBUYAU: An allocation worth RM50,000 was presented by the Assistant Minister of Coastal Road, Datuk Julaihi Narawi to develop edutourism here. Julaihi, who is also Sebuyau State Assemblyman, revealed that the money would be channelled to Samarahan Tourism Special Task Force to undertake the effort. “The Universiti Teknologi MARA (UiTM) may use the allocation without any restrictions to spearhead the edutourism in Sebuyau. “We want Sebuyau to become a centre of attraction just like any other areas in Sarawak. “To do this, we do not want efforts to stop at the launching ceremony. By injecting funds, programmes, events as well as the proper construction, can there be progress. “An example on how the money can be spent on is to conduct training sessions for the Sebuyau locals to become guides. 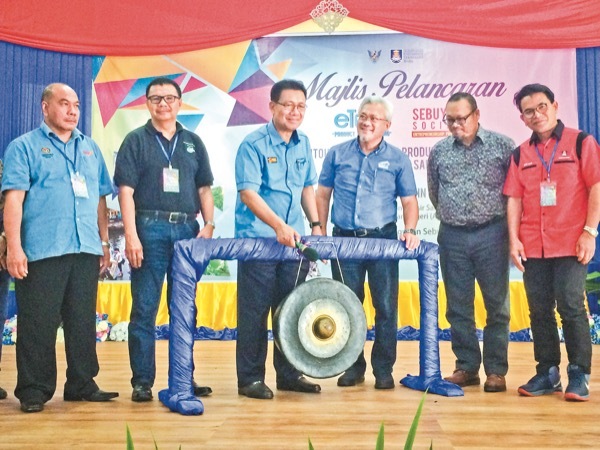 “Or even market the many unique dishes of Sebuyau such as the Ikan Terubok Masak Pindang,” he said during the launching ceremony of UiTM EduTourism at Dewan Pembangunan Sebuyau here yesterday. UiTM has been working together with Sebuyau since 2012 to develop various edu-tourism products which involve the students, lecturers as well as the local people. Some of the identified edu-tourism products of Sebuyau include Unexplored Green Environment, Unique Cultures of the coastal Malay, Iban and Chinese community as well as luscious landscape. This has produced products such as D’Buyo Expedition and D’Buyo Longhouse which enable tourists to experience fishing, cooking and have their meals on a boat. “Tourists also get to experience local dance and martial art showcase from the locals as well as experience living in a longhouse. “A significant tourism effort for Sebuyau will be the RM10 million worth chalet scheme that will be located in Sebuyau New Township. “The chalets are currently being designed and will be submitted to the State Planning Unit by April. We hope that the construction can start in June,” said Julaihi. Also present was Rector of UiTM Sarawak, Professor Dato Dr Jamil Hamali. RM50,000 for edutourism in Sebuyau constituency 0 out of 5 based on 0 ratings. 0 user reviews.